"We do not apply these channel names to any particular track. We supply them as UserComments on the multi-channel MasterMob in the AAF. ProTools picks up the channel names and applies them to whatever track it wants to. Clearly it does not always get them right. It is probably not helped by the fact that the WAV file contains channel names for tracks 1, 2, 3, 7, 8, 10, 13 and 14 when there are only 8 tracks." You might want to try the Stijn! Any news on this issue? We have the same problem here! Would you be able to send us your source clips so we can reproduce the issue here?I will email you some FTP details. I’m a pro-tools re-recording mixer / editing supervisor. I just started a new project which was edited on FCPX and exported by X2PRO. Great! AAF is opening; everything is in the session; handles; filenames and even channel names. BUT … something goes wrong here! X2pro messes up the metadata in the channel name field. I know it’s getting confusing but please allow me to explain it in detail. All channel names in FCP are correct and when I’m importing the original wav file in protools; the channel names are correct to; but the clips from x2pro aren’t. What happens? It all has to do with the channel numbers of the original sound file / fieldrecorder. ie. if a 6 track wav file is recorded on the first 6 audio tracks and are named in the metadata as “TRACK1”, and so on; everything works just fine. X2PRO put these clips in the right order but will mess up the ChannelName metadata! It will put tracks 10 & 11 in between 1&2 ! 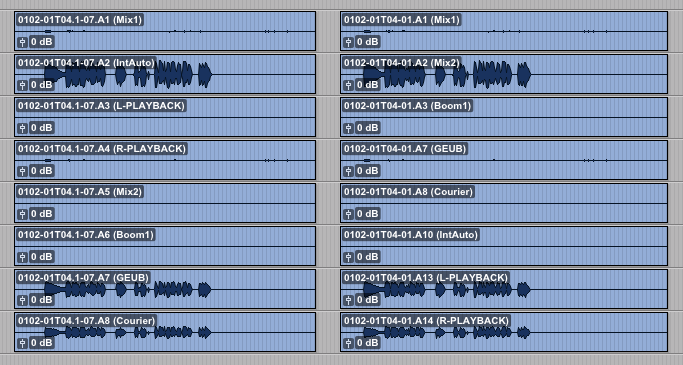 at the left you see the aaf import; at the right the wav file. The armed tracks on the field recorder were 1/2/3/7/8/10/13/14. You will notice that x2pro is putting the channel names from recordertrack 10/13/14 in between 1 and 2, although the audio in the clips stay correct/the same. This is the 4th project I’m doing with this workflow and I already encountered this 3 years ago; and now I’m still wasting time on this. Without this data, we have to listen to every single clip to know what it is ! Frustrating. I can provide you some files if this helps, and I hope you could fix this very soon!